As you may have noticed, not too much has changed from last year's favorites. 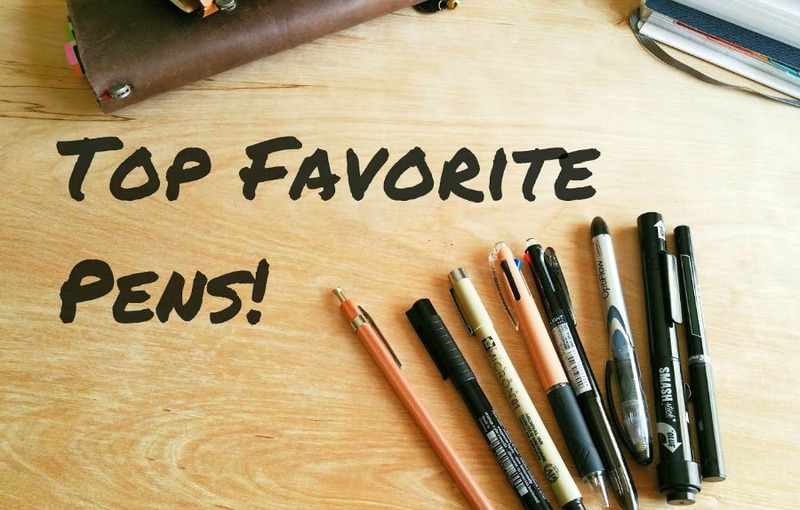 What are your go-to & must-have pens? Pilot and Sakura are my two favourite brands for pen. Zebra F-402. Been using them for years. I get the blue, fine point refills. New to me this year: Signo uni-ball 207. Light blue and purple. Some of the Paper Mate Ink Joy and gel pens are nice, too, but I like the first two the best. I also love the Signo Uni-Ball pens. The black will write on top of almost anything...Mod Podge, paint, etc. I especially love the Uni-Ball Signo White, although I have to order it online. Tell me more about the Staples OptiFlow pen, please? I will have to check out most of the pens you mentioned. I like microns, tul, and my favorite fountain pen right now is EF Pilot Vanishing Point, I also am using my Twisbi Eco a lot, but I like the Lamy Safari 1.1 stub too. I like Pilot Parallels for really big letters too. I use a Pilot Metropolitan often. It was given to me as a gift and I love it. I also like Jetstream. I bought one when I was in Japan and it's been used regularly ever since (plus, I now have the ones from my Hobonichi orders, which is good because now I have them in various places where I need to reach for a pen). Mine are the Lamy Vista, the Pilot Metropolitan, and several Pilot G-tecs, 0.3 & 0.4, in blue, green, and black. As a student (and avid doodler), my medical textbooks don't seem so inviting, so splashing them regularly with colors and commentary keeps me from stabbing myself on a regular basis. Also, as a student with expensive bills, they come in wallet-friendly prices.